This name is of Northern English locational origin either from Howgill near Gisburn in the West Riding of Yorkshire, or from Hugill in Westmoreland. The former was first recorded as Holegile circa 1240 and as Holgill in "Feudal Aids", dated 1285 and is so called from the Old Scandinavian "hol(h)" meaning sunken or low-lying, plus the Old Norse "gil", a ravine or narrow valley. The latter first appeared as Hogayl in the 1255 "Fine Court Rolls of Westmoreland", and as Hugayl in "Records of Kendale", dated 1274, The component elements in this placename are the Old Scandinavian "haugr", a hill or barrow, plus "gil", a narrow valley. The surname was first recorded in the latter part of the 14th Century, (see below). In 1683 a Robert Hugill of Preston was entered in the Lancashire Wills at Richmond. 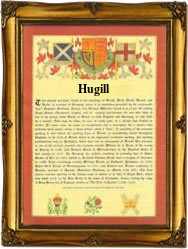 In the "modern" idiom the name is spelt Hugill, Huggill, Hughill, Hewgill or Howgill. The first recorded spelling of the family name is shown to be that of Matilda de Hogyll, of Sedburgh, which was dated 1379 - "The Poll Tax Returns Records of Yorkshire", during the reign of King Richard 11, "Richard of Bordeaux", 1377 - 1399. Surnames became necessary when governments introduced personal taxation. In England this was known as Poll Tax. Throughout the centuries, surnames in every country have continued to "develop" often leading to astonishing variants of the original spelling.